There are countless movie and book adaptions of the Robin Hood myth, and now we got another: Scarlet by A.C. Gaughen. In this one Will Scarlet is actually a girl. Only her band mates and a few select people know the truth; that she’s just Scarlet. Of course, the evil sheriff is after the poor people of Nottingham. But things get even more complicated when thief-taker Gisbourne enters the scene, someone from Scarlet’s past that she would rather forget. I am an utter Robin Hood newbie. Seriously, the only thing about the myth that I know is that he was a guy that stole from the rich and gave to the poor, and that he had some friends that helped him steal stuff. So I got into Scarlet with no expectations other than it being an engaging read. I was very satisfied with how the novel turned out to be. I have no idea if this book will also satisfy the hard-core Robin Hood fans of the world. The story wasn’t that very strong plot-wise. It’s pretty straight-forward with barely any twists you don’t see coming. 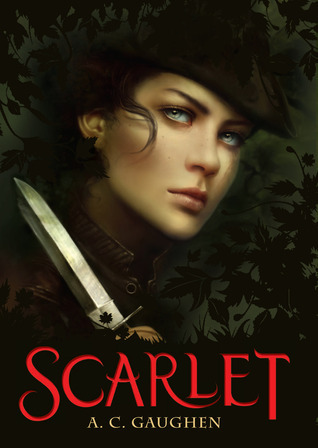 It was entertaining enough; there was a little mystery about Scarlet’s past that was interesting and wasn’t revealed until the end of the novel. The main way of creating tension wasn’t the plot but the characters. From the legendary Robin Hood “Rob” himself to the one-handed Much, and not to forget Little John. I loved them all, and how they stick together as a band. As any group of people that spend a lot of time together they bicker and banter but their camaraderie was heart-warming. I also enjoyed seeing the damaged but brave Scarlet between the guys, who don’t know whether to protect her or treat her as any other. Romance is a big part of Scarlet. At first I wasn’t so sure if I liked it the way it was going. Throughout the story I started to love all the characters, and about halfway I was hooked. Love is a strange concept for Scarlet, and it shows through the awkward moments she finds herself in. She is a rather angsty character who thinks she doesn’t deserve any people caring for her. Any time something happens she can’t deal with, she runs. Deep down, she’s a great person, and I loved her through all of her flaws. Lastly, I would like to make a note on the writing itself. It’s narrated first person through Scarlet’s eyes, which helps to portray her feelings. This also means that the whole book is narrated with Scarlet’s voice, who likes to refer to faces as “mugs” and to throats as “pipes” and other not so sophisticated epithets. It’s slightly hard to get into at first, but it has a certain charm to it. I wouldn’t want it any other way. I think Scarlet is a great adaptation of the classic Robin Hood tale, and one that will be enjoyed by older teens and adults alike. Many readers know the tale of Robin Hood, but they will be swept away by this new version full of action, secrets, and romance. Posing as one of Robin Hood’s thieves to avoid the wrath of the evil Thief Taker Lord Gisbourne, Scarlet has kept her identity secret from all of Nottinghamshire. Only the Hood and his band know the truth: the agile thief posing as a whip of a boy is actually a fearless young woman with a secret past. Helping the people of Nottingham outwit the corrupt Sheriff of Nottingham could cost Scarlet her life as Gisbourne closes in.